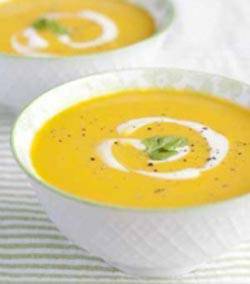 Add another layer of flavor to your squash soup. Here, we make use of coconut. 1 In a stock pot, heat oil and sauté the onions until translucent. Add ginger and sauté until fragrant. Add garlic and sauté for 30 seconds. 2 Add the pumpkin and let it cook over medium-low heat for 5 minutes until browned and slightly soft.